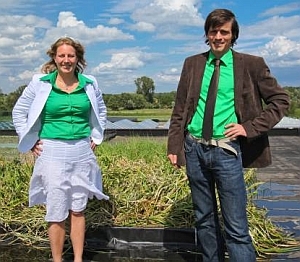 An environmental scientist at Wageningen University in the Netherlands designed a fuel cell that can generate electrical power from living plant roots and soil bacteria found in natural wetlands or vegetation on green roofs of urban buildings. Wageningen’s Marjolein Helder defends her doctoral dissertation today describing the technology, and she has started a company to take the technology to market. The plant-microbial fuel cell, as the device is called, draws electric power from the soil, particularly organic material excreted through the roots and deposited into the soil through photosynthesis. Bacteria around the plants’ roots degrade the organic residue, causing the release of electrons. The fuel cell developed by Helder places electrodes near concentrations of the bacteria, capturing and converting the released electrons into an electric current. In its current state of development, the plant-microbial fuel cell can generate 0.4 watts per square meter of plant growth, a power output greater than fermenting biomass. Helder says output rates of 3.2 watts per square meter of plant growth are possible in the future. The technology, says Helder, still needs refinements to make it renewable and sustainable. The placement of the electrodes, for example, must be optimized so they can capture and convert electric power, yet not consume the plant material at too high a rate. Promising sites for the technology are green roofs, where vegetation planted on the flat rooftops of urban commercial buildings absorb and retain rainwater and reduce heat radiation that raise summer temperatures in city centers. Other potential sites for for the fuel cells are natural wetlands, saltwater marshes with cordgrass that often attract migrating waterfowl, and cultivated rice paddies. Helder points out that plant-microbial fuel cell electrodes are buried in the soil and thus do not spoil natural views, interfere with water-flow like dams, nor compete with crop-growing farmland. Helder and Wageningen colleague David Strik started a company called Plant-e to take the plant-microbial fuel cell technology to market. Strik is postdoctoral environmental researcher and co-inventor of the technology, which Plant-e has patented. The electricity generated via the Plant-e fuel cell is low-voltage direct current that can charge batteries, cell-phones, and laptops as well as power LED lights. A demonstration project of the technology is in operation in the green roof of the Netherlands Institute of Technology building in Wageningen. Helder and Strik tell more about the fuel cell in the following video. I just worry about the need for all those electrodes to be placed near the plant’s roots. That sounds like a lot of capital cost for long-lived electrodes, and a lot of labor to install them! I’d like to see their projections of commercial viability. This may be the worst piece of junk science that I have ever read. Plants DO NOT excrete ANYTHING through the roots and photsysnthesis takes place in chloroplasts which are found in the leaves, not in the roots. This is basic freshman biology people, come on! It throws the validity of this entire article into question. Very discouraging. For the record, organic material is deposited into soild through the decompostion of dead plant material.